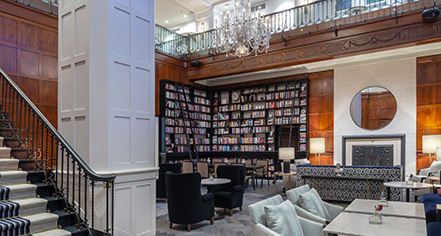 The Heathman Hotel, a Portland cultural fixture since the day it opened in 1927, recently completed a renovation that has polish this treasured jewel, renewed its luster, reaffirmed its illustrious past, and readied it for a bright new future. The restoration included the 151 cozy guestrooms and public spaces. Lighter, brighter, and more contemporary, the design is nonetheless rooted in the building’s unique history and pays homage to the hotel’s role as muse to generations of guests. The Heathman Hotel has been a Portland touchstone for travelers in the past and continues to serve as a welcome respite for friends and neighbors right here at home and visitors from around the globe. A prominent supporter of the city’s cultural and fine arts community, it is adjacent to the Portland Center for the Performing Arts and is attached to the Arlene Schnitzer Concert Hall. The hotel’s ties to the arts run deep and for years it has sponsored “Give to the Arts, Even in Your Sleep,” a program which donates a portion of the hotel’s weekend revenue to local arts organizations. Many of the hotel’s guest rooms feature views of the “Traveler’s Song” mural, a 9-foot high work by artist Henk Pander that was commissioned to adorn the interior wall of the attached concert hall. 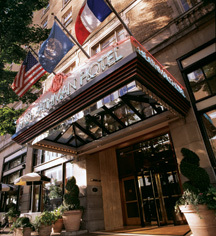 The Heathman Hotel, a member of Historic Worldwide since 2015, dates back to 1927. In the Heathman’s early years from the 1930s to the 1950s, the mezzanine was home to the studios of Portland radio station KOIN. Cancellation Policy: 48 hours, first night's room/tax charged if canceled within 48 hours. Deposit: Credit card needed to secure reservation upon booking. Extra Person Fees: Extra-person charges apply ($20). Hotel/Resort Fees & Taxes: Resort Fees: $25.99, plus Taxes: 15.3%. Occupancy Restrictions: 2 adults 1 children/room. Pet Policy: Service animals allowed: Yes. Pets allowed: Yes. Dogs and Cats. Fee: Yes. Dog: Ambassador: Zelda. Rollaways: Available upon request; surcharge ($20). Transportation: Transportation, including Limousine and Town Car Service, may be arranged through the concierge; rates apply. The Heathman Hotel, a Portland cultural fixture since the day it opened in 1927, recently completed a renovation that has polish this treasured jewel, renewed its luster, reaffirmed its illustrious past, and readied it for a bright new future. The restoration included the 151 cozy guestrooms and public spaces. Learn more about the History of The Heathman Hotel .